"During the first intermission of the Flyers' battle with the Rangers at the Wells Fargo Center [on November 4], Bill Clement [became] the fourth Broad Street Bully this year to officially become a United States citizen. Clement's teammates, Orest Kindrachuk, Bob Kelly and Dave Schultz, also were naturalized this year. Kelly and Kindrachuk were sworn in on Sept. 17 and Schultz took the Oath of Allegiance on Oct. 3. All three [were present to witness Clement compete the last step in his citizen process]. "I have always felt like a citizen, but I thought it was only right to actually become one," Clement said yesterday. "I think it is something that I have always toyed with but never actually had the time to do it. I can't speak for anyone else, but I know that I felt a lot of pride for America, especially after the terrorist attacks on Sept. 11. ...for so many things this year. Thanksgiving dinner is not at my house tonight. The Man. He single-handedly gutted and rebuilt our kitchen and it could be on HGTV. My two year old. He has rejuvenated my entire family and is a constant source of joy during each day. I have a new sister-in-law. I have a new nephew or niece en-route. My older two boys are both excelling academically, musically and athletically. My siblings all seem happy. Thankful I've remained nicotine-free for 2 1/2 years. and, Coffee...my last vice. Wait, is coffee a vice? Okay, Sweet potato casserole...my last vice. It used to drive me nuts when some many on the Left would give Bush the duel attributes of maniacal and stupid. They wanted so badly for him to be portrayed as dumb, yet they credited him with tons of plots that would take a truly evil genius (like, perhaps...George Soros). They never really seemed to grasp that the two just didn't jive. The same thing is happening again, but with America in the place of the former President. The Muslim world claims that America is both bigoted and stupid. We are accused to profiling Muslims and undermining Islam, YET that is a hard claim to make against a country that is constantly being duped by extremists. Recently an al Qaeda leader lamented about how "stupid" America is and how easy we are to fool (referring to the Taliban infiltrator we were negotiating with). Yet, in the next breath they are using our treatment of Muslims as a recruiting tool? Why aren't the Muslims they are recruiting smart enough to say, "Hey, if we can fool Americans so easily, doesn't that mean they are working with Muslims? Could we fool them if they were truly suspect of all of us?" And why aren't all the people that claimed it was Bush's warmongering ways and the fact that he was 'mean to Muslims' admitting they were wrong now that we've had two years of Obama and no drop in hate from the Middle East? Why did the deadliest year in Iraq happen under Barack Hussein Obama's watch? And why aren't all the people that spent years griping about the Bush administration and the evils of the Patriot Act kicking themselves that they voted for the man that wrote it. And why aren't they furiously penning conspiracy theories about why JOE BIDEN would have written the Patriot act in 1995...Six years before planes flew into the Twin Towers...? The Savage Manifesto in 2012? *I don't know if he means close the borders for good or seal them. I am NOT for permanent sealing, but for strict and structured immigration and assimilation. **I am against QUOTAS but am for Equal Opportunity and will even go as far as to say if a white guy and a black guy are equally qualified...give it to the black guy. What are they? Well, RIGHT WING NEWS has them listed. BUT, my favorite is still not there. I think the Internet was wiped clean of my favorite quote. And it was one she took a lot of heat for. It was about liberals hating Christians and loving Muslims when the only difference between them was terrorism...so liberals must love people that want to kill Americans. Something to that effect. My favorite of the 25 listed over at RWN? "Here the country had finally given liberals a war against fundamentalism and they don't want to fight it. They would have, except it would put them on the same side as the United States." This is a United States Senator. I don't want to beat a dead horse here, but a UNITED STATES SENATOR claiming the Land of the FREE would be better off if the government closed down two NEWS outlets?! Why isn't EVERY news outlet across the country screaming from the rooftops about this? "A New Jersey pastor is continuing to take on Facebook. Rev. Cedric Miller says this Sunday he'll ask that all married members of his Neptune, Monmouth County, congregation give up the social networking site. He has already told married church leaders to delete Facebook or quit. Miller claims a large percentage of his marital counseling over the past year has included infidelity that stemmed straight from Facebook. He says it is breaking up marriages and tearing families apart. I have to agree with this guy. I can't tell you how many friends I have seen fall (or are currently falling) at the hands of social media... Hmmm, I feel a book in the making! Seriously though, it's not just Facebook. Most Facebook people are so obsessed because it's their first foray into the computer as a social medium. Early chat room users, bloggers, etc had been there, done that and already knew the tangible dangers of too much virtual interaction. I think a joint account is the way too go for married couples. A few of my friends have had that from the start and I think it's smart... Like my Dad always said, Don't help a good boy go bad. "Target, [a female shepherd mix that has appeared on Oprah], was one of three dogs credited with helping to save U.S. soldiers in Afghanistan. Soldiers in [Sgt. Terry] Young's unit befriended the strays, Target, Sasha and Rufus, who more than repaid the favor on Feb. 11 when an intruder tried to get into the soldiers' barracks. The dogs began barking and snapping, alerting the soldiers. Unable to get inside the barracks, the intruder -- who had 25 pounds of explosives strapped to his body -- blew himself outside. Five soldiers were wounded, but Young and his comrades said the dogs saved many lives. Sasha was badly injured and had to be put down, but the soldiers were able to bring Rufus and Target to the United States. Target moved in with Young and his family in Arizona. Rufus went to live with Sgt. Christopher Duke in Georgia." "...Allegedly set off by Bristol Palin’s appearance on “Dancing with the Stars,” a rural Black Earth man kept police at bay outside his home for 15 hours Monday and Tuesday before he surrendered to police. Steven N. Cowan, 66, railed at the television as the daughter of former Republican vice presidential candidate Sarah Palin appeared on the ABC program, his wife told police Monday after she fled from the town of Vermont house, according to a criminal complaint filed in Dane County Circuit Court. Though I have attended a few Tea Parties here in the City of Brotherly Love, there has been a nagging concern I've had regarding their political future and more specifically my sustained involvement with them: social issues. The Tea Parties have focused mainly on shrinking government and taxes and I'm all for that, but my agenda goes deeper. My morals demand more. My ideology doesn't stop at the almighty dollar. The Tea Parties demand an attitude of no-compromise. Vote out the fiscal RINOs. Vote out the establishment. BUT, the term "Republican in Name Only" began to describe GOP candidates and Congressmen that were lax on social issues...not necessarily fiscal ones. So the message has always felt a bit hypocritical to me. Don't compromise at all fiscally, but totally compromise on social issues? Don't vote for a bad bill to keep your seat, but don't talk about your views on abortion in order to get the seat? "On an interview on the C-Span TV show, Booknotes, Jonah Goldberg, author of Liberal Fascism (highly recommended), spoke of two kinds of conservatives. The first is anti-liberal; they believe that there is a place for central government control, but that they are better suited or prepared to exercise that control than the ‘liberals’. The second kind of conservative is anti-statist; believing that central control or planning should be kept to minimum or decentralized as much as possible to the local level. The difference between this kind of conservative and a libertarian may be the decentralization of power as opposed to the greater absence of power. But Goldberg noted that a much greater devolution of power to the local level would probably satisfy 90% of libertarians’ concerns about excessive government power. The last two elections may look like a fickle electorate, but the central common theme was a rejection of central statist control and a demand for less government intrusion. While one could argue that it was foolish to believe that the current administration had any record of reducing statism, when they quickly displayed the largest growth of statist control since FDR it was quickly and strongly rejected. In the interview Goldberg was asked to clarify a definition of a conservative. 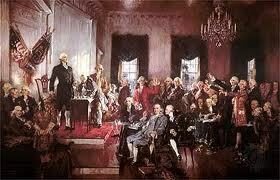 An American conservative is one who wishes to conserve the tradition of the American Revolution. This is distinct from a European conservative who wishes to preserve the old order of the statist powers; the very powers that the American revolted against. The American Revolution and our constitution was specifically designed to avoid the kind of statist control that marked the European political structure. So while the American conservative is trying to ‘conserve’ the American established order, they would be considered ‘liberal’ to the old European order. The values of an American conservative are more in line with a classical liberal tradition of less statism and more individual rights. The classical liberal tradition would also value reason and openness with a pragmatic approach to dealing with human nature. The current American liberals reject the American ideal and favors the European ideal of greater statist control as a solution to social problems. The Tea Party movement in its very name seeks a return to the unique American experience that rejected European statism. They have rejected the false conservatism of a merely different statist approach, and they reject the liberal notion of a return to European Statist ideals. The reason I generally avoid the terms liberal and conservative is that they have become pejorative terms that create such reactionary presumptions that listening and communication ceases. It seems that when an idea is presented outside of those labels that the first reaction of a partisan is to apply the right label and then respond, as either a ‘liberal’ or a ‘conservative’ would respond. We need to get beyond that." So here we go again...another election over and a new political landscape for all of us to navigate through. Here's a question...all other considerations aside, do you think if we're at roughly 5 percent unemployment in early November 2012...will Obama get re-elected? Or is it just not that simple anymore? Where was the CIC on Veteran's Day? "...So that is why your president is halfway around the world instead of being here in the United States to celebrate the sacrifices American soldiers, sailors and airmen have made around the world to keep the real, still-burning flame of freedom alive. Obama honored our veterans from afar by laying a wreath during a ceremony at an Army base in South Korea last night. That is a distance from here matched only by the chasm that has opened up between him and the voters who elected him two years ago. This aloofness of his really is becoming a problem. Not that Obama doesn't appreciate the sacrifices of veterans. He absolutely does. Just ask the Indonesians. He was in Jakarta for their Heroes Day this week to honor their veterans "who have sacrificed on behalf of this great country." "This great country," of course, being Indonesia. "When my stepfather was a boy, he watched his own father and older brother leave home to fight and die in the struggle for Indonesian independence," Obama told the audience. And the White House wonders why so many people think there is something foreign about this guy. I wish I could bottle and share the feeling of thankfulness and pride that I experienced yesterday as I was introduced to so many women that gave up relationships, jobs, parenting and health to serve their country. And all of them remain SO proud of their service despite having it belittled by some that ignorantly still claim that women aren't in combat... I WISH Barack Obama and the First Lady could have met these women and felt the tangible wave of appreciation coming from the crowds that gathered just to say "Thank you." American Women Veterans had an essay contest open to service women returning from deployment to Iraq or Afghanistan this past year. The winning veteran, a Navy Lt. Commander, was flown to NYC to walk in today's NY Veteran's Day Parade (televised this year). You can read her insightful, winning essay HERE. And for all you veterans...there are TONS are freebies out there for you today (here's the listing of a few). She looked like she wanted to be harder on him than she was...she was charmed, you could tell. For those of you that missed it, Bush 43 was on the Oprah Winfrey show yesterday. I broke my NO OPRAH pact for Laura Bush and overrode it again yesterday for W...and I'm glad I did. Not only did he explain away any 'accusation' (Katrina) with a linguistic ease that critics claimed he never possessed, he continued to rise above the fray and remained the exemplary ex-President. I know it's much too much to ask of a MSM reporter, but I'd love one of those CNN reporters to follow up with Clinton and Carter and see what their justifications would be... Of course the CNN couple mention Cheney, but as much as some of us would have relished it...he was never the President. GWB was promoting new book Decision Points. Do We REALLY have the Best Legal System in the World? Places in the Middle East perhaps where you can be hung for being gay and stoned for being raped... Places that practice Sharia Law...? "A federal judge issued a temporary restraining order Monday to block a new amendment to the Oklahoma Constitution that would prohibit state courts from considering international or Islamic law when deciding cases. A Philadelphia jury deadlocked on whether to give a man THAT ADMITTED HE KILLED A COP IN COLD BLOOD the death penalty (source). Why bother having a death penalty at all...if a confessed cop killer doesn't get it--who would? Every time I read a story about San Francisco --whether it be a would-be ban on the military, an expose about producing politicians like Nancy Pelosi, banning Happy meals or the sale of puppies and kittens or that of a transgender youth leader killing his/her sugar daddy-- I can't help but feel it's an almost-foreign land. Who are these people that aspire to attend UC Berkeley? Who would want to live in a city that even the NYT's asks, "What will San Francisco ban next?" How did this this bastion of far left liberals and radical Greens take hold and where is its Libertarian counterpart? And then I thought about The People's Temple and couldn't help but wonder if this mass drinking of the Kool Aid could have happened anywhere but San Francisco. You know, Jim Jones had originally set up camp in Indiana, but moved his "church" to a more receptive environment... Would 900 "temple" members have partaken of the Kool Aid in any other city? You may recall the recent post about the "liberal gene"...Is there something genetically wrong with San Franciscans (and others that aspire to live there)? The other day I overheard a woman talking about "that idiot in the White House." That same night I heard the audio of the Democratic crowd in Connecticut booing the President and not allowing him speak. Both things I find extremely disgraceful. What is my point? I guess that I'm disappointed that the Office of the President means so little. That regardless of the ideological differences, we can't at least agree that this person was Democratically elected and demands a certain amount of our respect. I cringe at the thought of things being said in front of children across the country --now and throughout the Bush years... I hope that parents are explaining that it's the POLICIES and the misinformation we oppose. "[Republican Mark] Kirk’s capture of the Senate seat once held by the president, deals an embarrassing blow to Democrats. Almost as sweet as Scott Brown's capture of Teddy Kennedy's seat. And now all the talk is about compromise... I thought we were the obstructionists, the ones with no ideas, the party of no...? Like Rush said yesterday...we won. Why would we compromise. Losers compromise. What was their mantra in 08...mandate, mandate, mandate? Great News: Nancy Pelosi is indeed fired. Bad News: Harry Reid isn't. Great News: Alan Grayson is GONE. Bad News: Allyson Schwartz isn't. Allen West won! Pat Toomey won! Pennsylvania has a Republican Governor...as does Ohio! South Carolina has its first female Governor. The West Coast was a disappointment as usual...though I am shocked that Californians voted down Prop 19. Did they think that being a veteran was the tactic to combating progressive views this election? Well, it didn't work for Joe Sestak or Patrick Murphy... I appreciate their service and thank them for the right to vote against them, but that doesn't make their ideology any less detrimental for the country. Well, maybe they didn’t force him, but they encouraged him… No? Well you have to acknowledge the immense pressures that a top teir restaurant like McDonald places on its managers to ensure quality, right? Turns out this guy felt that he had to sample the products several times a day to ensure quality. Don’t you take a bite out of every burger that comes off your grill at home to ensure quality for your guests? I know I do. McDonald’s response is that they are “weighing their options.” [source] Pun intended? Well said. My mom just got off the phone with the Philly DA's office. Her polling area opened over an hour late. Some people left. Others waited for that hour in the 31 degree morning air. She lives in the section of Philly that pays the highest property taxes. She lives in the Republican enclave of the city. You're just a bunch of cows. Well, that isn't so hot. And threw us in a hole..."
Project Valour-IT, in memory of SFC William V. Ziegenfuss, helps provide voice-controlled/adaptive laptop computers and other technology to support Soldiers, Sailors, Airmen and Marines recovering from hand wounds and other severe injuries. In order to fund the thousands of laptops we have distributed and need to distribute, we have an annual competition. All branches of the Armed Services compete to raise the most cash for the cause. Let's see who can raise the most money to help reconnect our wounded warriors with the world! Blonde Sagacity is a member of TEAM ARMY! WHAT: Friendly fundraising competition for Valour-IT.WHEN: October 28th through Veterans Day, November 11th. Team Army's goal is $15,000.